Emerald Flame, L.L.C Washington D.C.
Robin Shipp: Owner, operator ad C.E.O. Company: Emerald Flame, L.L.C. Washington D.C. and Alexandria, VA. I will travel up to 225 miles. "It's Cajun-American food with a healthy twist." Cajun based food such as 'Robin's Awesome GumboLaya', Creole Chili, Cajun Bake (Turkey Smoked Sausage, Cajun boneless chicken, Add Shrimp if desired, and small cuts of seasoned corn on corn). 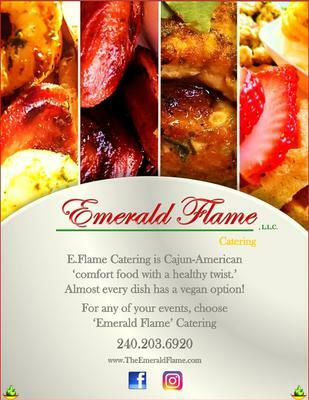 Emerald Flame also provides, Brunch and breakfast such as 'Nola'(Cajun) Hash-bowl', Cinna-Apples and Smoked Sausage, Brunch Love (Breakfast/brunch sampler), Salmon Croquettes (cakes) and Confetti Eggs (Scrambled eggs with red and green bell peppers). E.Flame also has simple items such as Crab cakes, Deviled eggs, 'Meatballs 'Kodenn' (Turkey Meatballs), and more. The sides include, 'Pasyon Potatoe wedges' ('Passion'Sweet potatoes wedges with Cinnamon Sugar and a kick of heat), Confetti corn, Kanaval Rice with 'Robin's Awesome GumboLaya' gravy. Join in and write your own page! It's easy to do. How? Simply click here to return to Maryland Vendors.